It seems like just a few days ago that I was finishing up my summer internship at McKinsey and getting ready for classes to begin but here we are now almost done with the first semester… It is truly amazing how quickly time flies during business school. 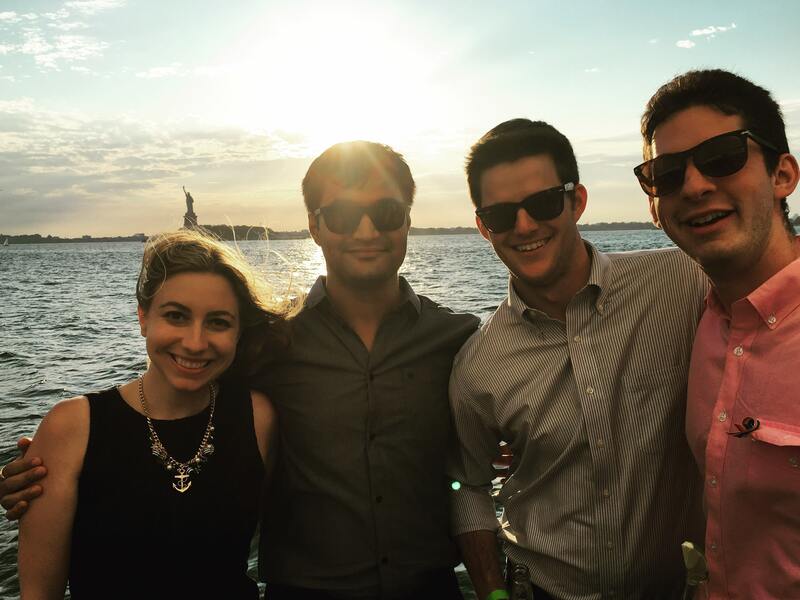 Myself and Stern classmates who also worked at the New York office of McKinsey on a sunset sailboat cruise around the Statue of Liberty after work one night. Some of the most common questions I receive from prospective students considering Stern are about how to prepare for recruiting. One of my favorite aspects of Stern is that everyone in the Stern community works incredibly hard to make sure you are prepared for interviews. As someone heavily involved with the recruiting process for consulting, I thought it would be helpful to share a taste of what I am currently working on to give back to first year students. In my official capacity as a career mentor with the Office of Career Development, I host many helpful events for students. Before school was really underway I worked with students during the IGNITE workshops to write, practice and perfect their 30 second elevator pitch to employers. I reviewed the resumes of 12 students who are recruiting for consulting, then met with them one-on-one to help them wordsmith their points to make the strongest skills stand out. Right now I am working with other MBA2’s to host sessions on recruiting topics like how to navigate the corporate presentations and what to do during informational interviews. Before interviews start in January I’ll work with another group of students one-on-one to do practice interviews so they will be completely ready when on-campus interviews begin. As a board member of the Management Consulting Association, I co-lead MCA’s weekly casing bootcamp session with another MBA2 student Michelle. Bootcamp happens every Wednesday afternoon and we teach how to do the technical part of a consulting interview, the case, from start-to-finish. From the framework, to the conclusion, with all the brainstorming, charts, and math you will ever need in-between, the eight interactive weekly sessions will get anyone ready to crush their case interview. If the promise of succeeding in the interview isn’t enough, we also provide awesome snacks like empanadas, cookies, and cannolis, to get your brain moving. Students enjoying the last session of bootcamp with amazing Greek pastries. Over 20 MBA2’s, including myself, help prepare first year students interested in consulting through MCA’s mentorship program. Every Tuesday morning I meet with five first years to help work through the topics from bootcamp in a smaller group setting as well as answer any questions about the recruiting process. It is an opportunity for first years to get an honest perspective on tough questions like how to request an informational interview as well as a chance to get to know their classmates better. As the application deadline approaches I’ll review their cover letters, help fine tune resumes, and give one-on-one case coaching so they’ll be as prepared as possible for their interviews. There are many more examples of peer-led preparation I work on including the two for one casing initiative, corporate case competitions, informal coffee chats, and much more. Stern is really an amazing community where everyone invests in the success of their peers; feel free to reach out if you have any questions!